Instant JChem and Plots I wrote a review of Instant JChem from ChemAxon a little while ago and since then there have been regular updates. 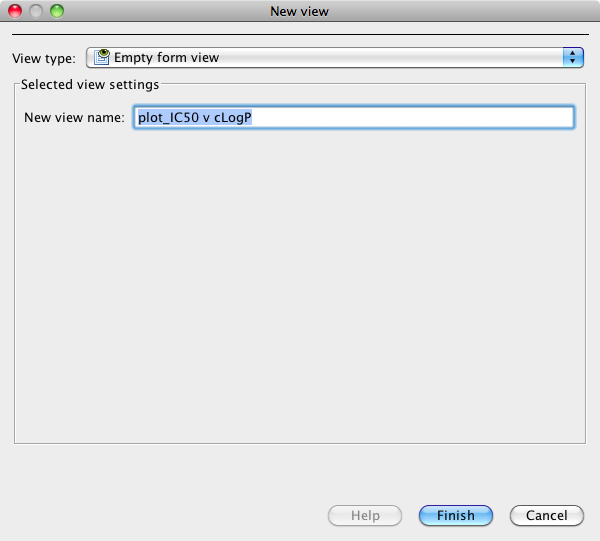 One feature that has been added is the ability to add plots on forms and so I thought I’d review this feature. 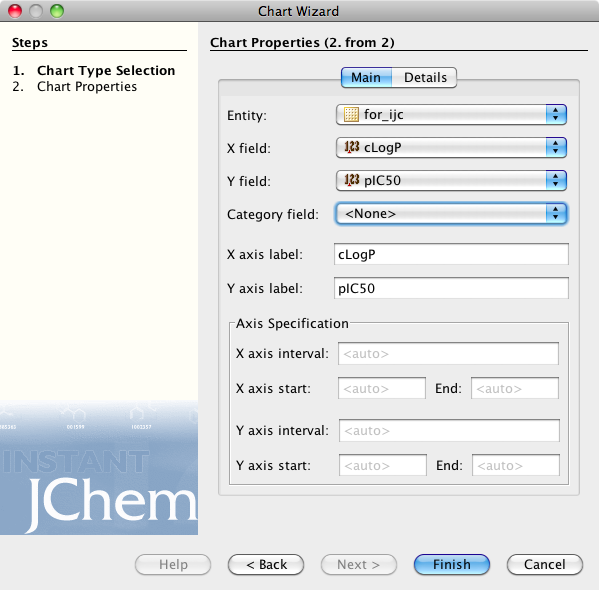 Instant JChem is a desktop application for end user scientists. With Instant JChem you can create, explore and share chemical and non chemical data in local and remote databases without additional administration. Instant JChem has a wide and growing range of functionality including customizable database views, integration of library enumeration and dynamic population of columns with singular and combined molecular property and descriptor predictions. In the latest version there is now a Instant JChem Visualizer Add-on that allows you to add a number of plot types to forms. 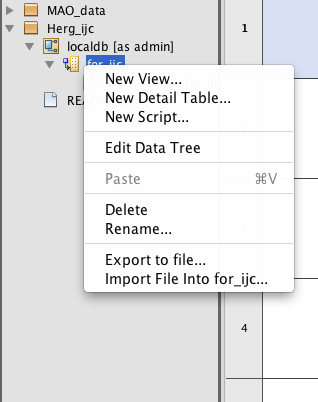 To do this simply right click on the tree menu of data sources and select “New View”, set the view type to “Empty form view” and give it a title. 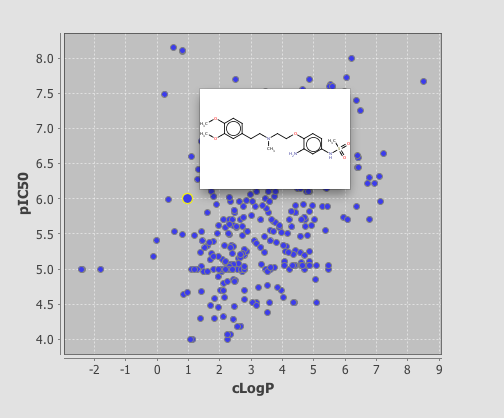 I’m using a dataset of HERG ligands for which I have the experimental pIC50, the calculated LogP and I’ve used the calculated pKa to categorise the molecules into acidic, basic, neutral or zwitterion. Select the “Design” tab and then click the plots icon. 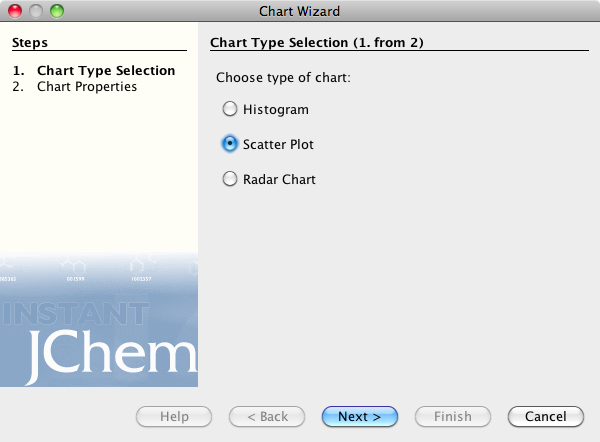 Currently Instant JChem can display 3 plot types, histograms, scatter plots and radar plots, for this display I chose the scatter plot option, this opens the Chart Properties dialog. Here you can choose the fields to display on the X and Y axis, and modify the look of the plot. If you now click on the browse tab you can see the plot displayed, I should note I’m using the demo version and it is restricted to 350 rows, unfortunately rather than simply display the first 350 rows you actually need to delete any extra rows before it will display. As you can see below clicking on a point displays the associated structure. 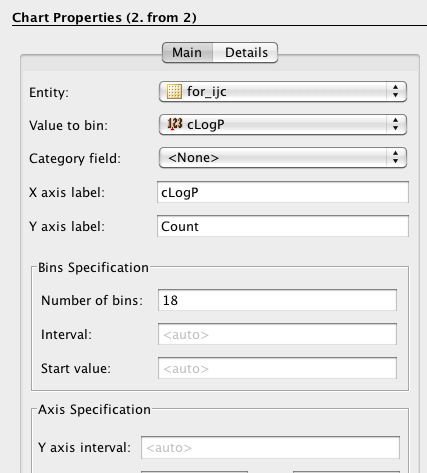 If you need to edit the display return to the Design tab and double click on the plot. 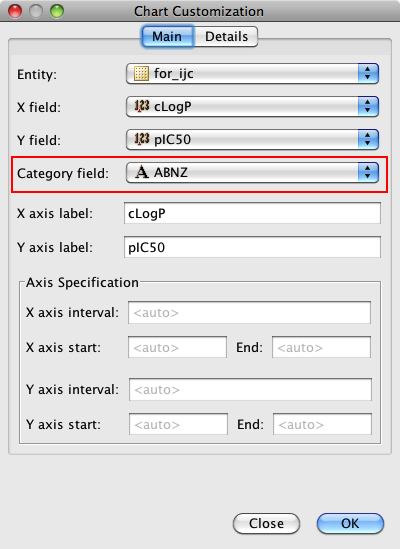 One very useful feature is the ability to add a category field, I added the field where I had used the calculated pKa to categorise the molecules into acidic, basic, neutral or zwitterion. 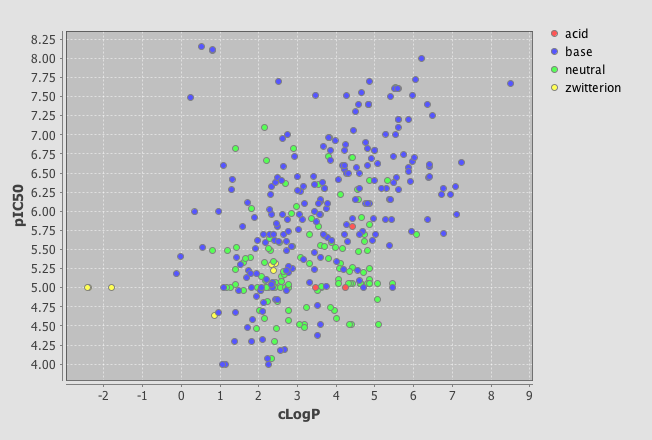 As you can see below the plot is now colour coded according to the category field. 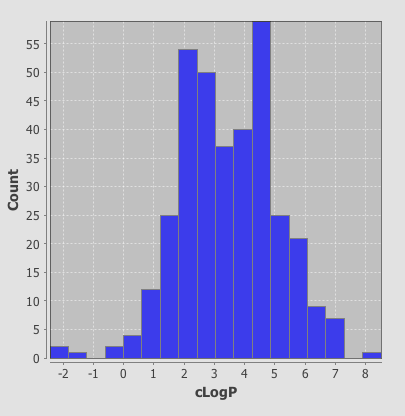 As well as scatter plots it is also possible to add histograms, go to the Design tab, click on the plots icon and this time choose histogram, choose the field to bin and return to the browse tab.